INDIANAPOLIS (AP) — The most difficult part of the NCAA’s attempt to clean up college basketball begins now. 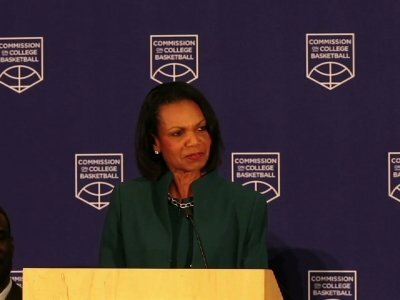 Hours after former Secretary of State Condoleezza Rice presented the Commission on College Basketball’s sweeping recommendations for reforming a sport weighed down by corruption, NCAA leaders set in motion the process for turning those ideas into reality. The Division I Council, comprised mostly of athletic directors and headed by Miami AD Blake James, has the job of turning the recommendations into rules. That requires feedback from schools, then council votes with some conference votes counting more heavily than others. Each proposal then goes to the Board of Directors, where a majority vote is needed to send it to the Board of Governors for final approval. It’s a winding path — crossing 351 Division I schools with varied priorities and concerns — and requiring consensus building and compromise for measures to pass. NCAA rule changes can sometimes take a full calendar year to sort out. The independent commission Rice led released a much-anticipated and detailed 60-page report , seven months after the group was formed in response to a federal corruption investigation that rocked college basketball. Ten people, including some assistant coaches, have been charged in a bribery and kickback scheme , and high-profile programs such as Arizona, Louisville and Kansas have been tied to possible NCAA violations. The proposals were wide-ranging, falling mostly into five categories: NBA draft rules, specifically the league’s 19-year-old age limit that has led to so-called one-and-done college players; non-scholastic basketball such as AAU leagues and summer recruiting events; the relationship between players and agents; relationships with apparel companies; and NCAA enforcement. “Some people like some of (the recommendations) more than others, which is human nature, but as a board we’re unanimous in the endorsement and the acceptance of these recommendations for the NCAA,” said Minnesota President Eric Kaler, chairman of the Division I Board of Directors. It’s not yet clear how the governing body would pay for some of the proposals, though the NCAA reported revenues of more than $1 billion dollars for fiscal year 2017 in its most recent financial disclosures. The commission offered harsh assessments of toothless NCAA enforcement, as well as the shady summer basketball circuit that brings together agents, apparel companies and coaches looking to profit on teenage prodigies. It called the environment surrounding hoops “a toxic mix of perverse incentives to cheat,” and said responsibility for the current mess goes all the way up to university presidents. It also defended the NCAA’s amateurism model, saying paying players a salary isn’t the answer. The commission did leave open the possibility that college athletes could earn money off their names, images and likenesses , but decided not to commit on the subject while the courts are still weighing in. “I’m confident they are going to be very supportive,” Emmert said of the NBA and NBAPA. The NBA and players union praised the recommendations on enforcement and expressed concerns about youth basketball. On draft eligibility rules, however, there was no commitment. “The NBA and NBPA will continue to assess them in order to promote the best interests of players and the game,” they said. “One-and-done has to go one way or another,” Rice told the AP. Instead of show cause orders, which are meant to limit a coach’s ability to work in college sports after breaking NCAA rules, the report called for lifetime bans. “The rewards of success, athletic success, have become very great. The deterrents sometimes aren’t as effective as they need to be. What we want are deterrents that really impact an institution,” said Notre Dame President Fr. John Jenkins, who was a member of the Rice commission. The commission proposed the NCAA create a program for certifying agents , and make them accessible to players from high school through their college careers. The NCAA, with support from the NBA and USA Basketball, should run its own recruiting events for prospects during the summer , the commission said, and take a more serious approach to certifying events it does not control.